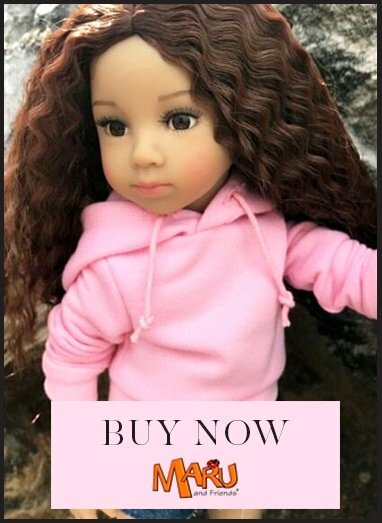 Brand: D'Nenes Eye type: Brown/Fixed Size: 36cm/14.2" Hair: Black/ Rooted Articulation: 4 points We are delighted to be the exclusive retailer in the UK to stock Carmen Gonzalez's beautiful Marieta dolls. It is a vast range, and throughout the year more from the collection will be added, so snap up the one you want when you see it because it may be replaced by another - and check regularly to see our new Marieta dolls which are arriving all the time. The D'Nenes production takes place in Spain, and all materials for the dolls and clothing are products of Europe. The dolls have cute toddler like expressions, and gorgeous bodies - and of course they can stand up as their bodies are totally vinyl. Marieta is 36cm/ 14.2" tall. The black hair is sewn into the head and the brown eyes are acrylic with a realistic patina. Her hair is short but she has 2 long 2 plaits tied away from her face. Her vinyl is brown. She has joints at the shoulders and hips so that she can stand and be positioned for activity. Marieta dolls are safety tested for children from age 3 and My Doll Best Friend recommends her to girls of this age upwards as her body is similar to that of young children. However, we know that these dolls are appealing to grown ups too!